Featuring the voices of Diego Luna, Channing Tatum (22 Jump Street, Magic Mike, G.I. Joe) and Zoe Saldana (The Guardians of the Galaxy, Avatar) in this beautifully designed animated Mexican world(s), The Book of Life celebrates both Halloween and the Mexican’s Day of the Dead with story about a bet between the ruler of the Land of the Remembered La Muerte (Christina Applegate) and ruler of the Land of the Forgotten Xibalba (Ron Perlman) on who, among Manolo (Luna) and Joaquin (Tatum), will win the heart of Maria (Saldana), who are all friends since kids. Due to Xibalba’s cheating ways, Manolo is forced to go through challenges of all three different Lands to be with his true love while trying to realise his dreams of becoming a musician. Sounds a lot of a 95-minute film? Well, because it is, and I haven’t even mention about the threatening large group of bandits that are on the way to their town. Overstuffed formulaic plot with too little time to develop and end without rushing or at least, not being too convenient and casual, especially the second half of the film where it takes cliched path. If they had a more creative writer on board, this film could’ve probably been something truly refreshing. The humour may be a bit too slapstick for everyone’s taste but it mostly works, which helps keep the film entertaining for the adult audience as well. But the most and perhaps the only impressive aspect of The Book of Life is its spectacular art direction. With that being said, appearance wise it’s different, but on the inside it’s pretty much generic. The question then becomes whether or not the director, Jorge R. Gutierrez (who’s actually from Mexico), managed to make good use of typicality, which I think he really did in the first half. The art concept of having the characters in various wooden figurine forms in old Mexican style is pleasantly unique, although the dead version of the characters did remind me a bit of the iconic Jack the Skeleton character from Tim Burton’s Nightmare Before Christmas (1993). 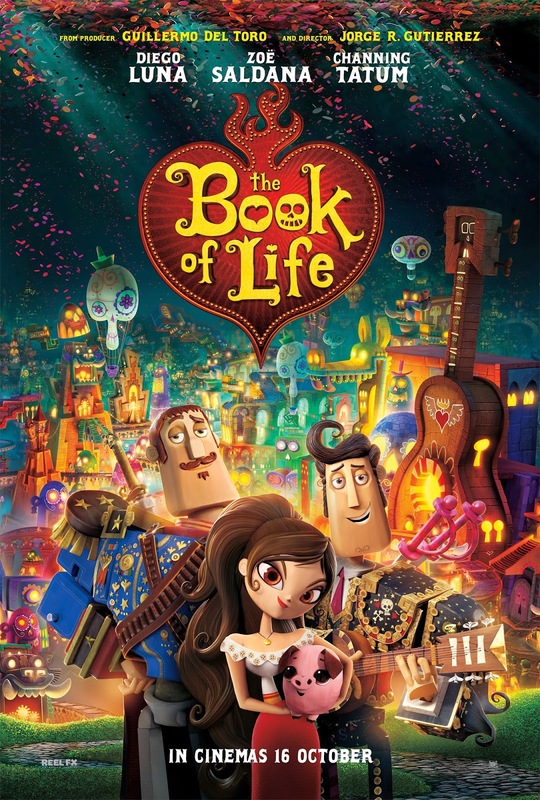 Comically voiced by the cast, the characters in Book of Life are squarish and toy-like but they’re extremely lively with no barriers of showing any expression. Some of voice actors did a pretty good job faking the Mexican accent as well. These elements clearly shows the strengths of the director’s Mexican vision. The design of the Land of the Living and the Land of the Remembered are amazing. It was particularly fun to watch the latter Land, it’s close to how I would imagine an awesome heaven would be like, but unfortunately that scene doesn’t last for more than 10 minutes. The film, strangely, also lacks of cute characters for the younger audience, which all blockbuster animations these days would have. It does have a baby pig, but it’s not so adorable anymore later on in the film when it grows up. The story is obviously not without moral values and positive messages. Manolo is torn between following his own ambition of being a musician and his family’s expectation of continuing the family’s bullfighting legacy, so in the end he has to decide he could sing his tune from the heart to please both himself and his family while capturing Maria’s heart. His love rival is his supposed best friend Joaquin, who is charming, confident and inhumanly strengthened by Xibalba’s magical pin. It all boils down whether Maria prefers someone with a lot of heart, or someone who’s just strong and capable of protecting the town. While the story’s very much between to guys going after the same girl, there’s a lot of girl power portrayed in Maria as well. She stands up for herself when she feels offended and she would get her hands dirty without hesitation to save the town and helpless animals instead of just sitting there waiting to be rescued by men like in most typical animations. The film also has a few musical moments where Manolo uses his guitar and singing instead of swords to express his feelings in different situations. He plays songs from Radiohead to Elvis Presley to the more recent pop songs, very well done in Mexican accent, which is also part of the fun even though it’s not strong enough to emotionally engage. So the film has music, death, afterlife, romance, humour – which makes me wonder, what if the producers hired Tim Burton to direct and Danny Elfman to score the music instead? They’re a very expensive gamble but this is right up their alley. It could’ve probably been a lot better, or just slightly worse, minus Gutierrez’s refreshing Mexican direction. To watch in 3D? It wasn’t shown in 3-D at the press screening but I guess it should have at least a bit of impact since the characters are like wooden figures, that I believe would be perfect for more pop-out effects to entertain kids. Censorship in Malaysia: Clean family cartoon. Pigs for pork are not cut either, not for the press screening at least. Second opinion: My girlfriend liked it as well, especially the art direction. Verdict: Surprisingly better than expected. An easy-to-enjoy popcorn animation with awesome visuals. Just too bad for the overly rushed and generic second half.